Sausage and cabbage is one of our favorite, EASY dinners. As most of you know, my husband does the cooking in our house. It’s also just the 2 of us. Robbo is self trained … Food.TV, books and YouTube …. he is an amazing chef! I am his sous chef. One tip from Robbo is to cook as if you were cooking for company. Double your recipes. Making more doesn’t actually take more effort. We get through the week on leftovers. Another Cooking 101 tip: Use sharp knives. 2 small heads of cabbage chopped. You can use a food processor. For this particular recipe, I think the food processor chops too much. So, hand chopping it is. Be generous with the olive oil. Salt and pepper. After you add the salt and pepper, use your hands and just toss the cabbage around a bit. 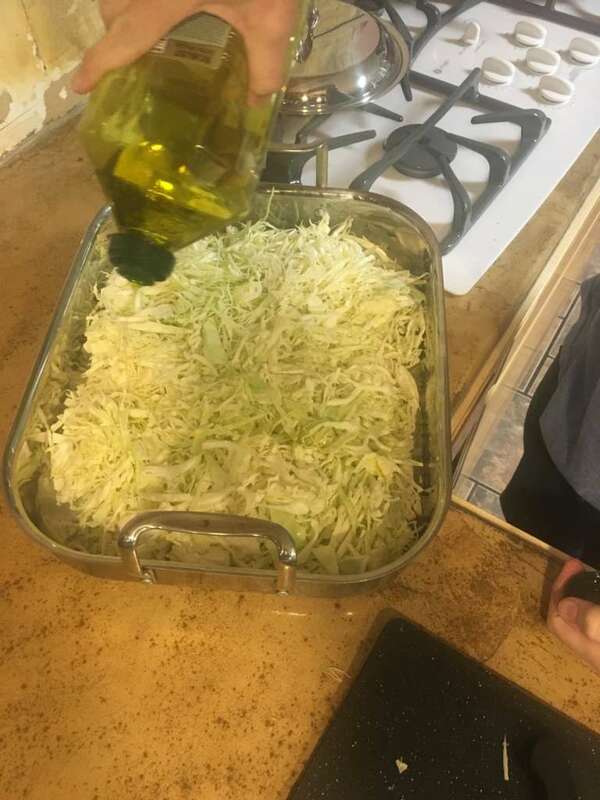 This incorporates the olive oil, salt and pepper evenly through the cabbage. These are bratwursts from Slow Poke Farm. You can buy them from their store in Cisco. They are also in the freezer section of Drug Emporium. Use a sharp knife and poke each sausage 2 or 3 times. Roast in the oven at 425* for 30-35 min. It’s OK if the cabbage browns a bit. I like the brat’s to be well done. This will give us about 4- 6 good size servings. We had some sautéed cherry tomatoes and asparagus with our sausage and cabbage. So, while the cabbage and sausage are in the oven, you should have time to get these 2 sides made up and even a little clean up. Cherry tomatoes, bacon grease, thyme and fresh basil. Bacon grease = lard. The cast iron pot will be for asparagus. * For those of you who think my life is always together …. yes, that is exposed dry wall behind our stove top. We removed the backsplash ourselves to replace with a beautiful new Moroccan tile. That was 10 months ago. The tile is still boxed in the corner. Using a sharp chef’s knife, Rob chopped about an inch off the bottom of the asparagus. This gets rid of the most chewy / fiber-y part of the asparagus. Use your fingers and run them down the thyme twigs pulling off the thyme. Firm grip. Stack the basil. Then roll the basil. Using the chef’s knife again, make thin slices through your basil roll. You’re just learned how to chiffonade!! We got the large container of cherry tomatoes from Market Street. Dumped the whole container into the melted, slightly sizzling, bacon grease. Sautee away. A few minute for the tomatoes with the lid on. A little water in the bottom of the pot. Add steamer rack. There should not be so much water that your rack floats are even has water coming through its pores. Add asparagus. Like Robbo’s neatly stacked arrangement? For thin asparagus steam about 8 minutes. Thick asparagus like this, 12 min. Watch for that sizzle and the skins become a bubbled. Getting close. Turn off the heat. Add the thyme and basil. A little salt and pepper. Look at those colors. Cook from your heart, eat for your soul and gather together for your spirit.